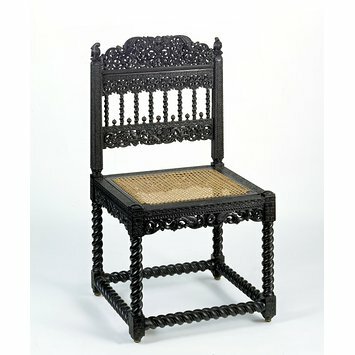 Richly carved and pierced ebony chairs and tables of this type were made for European consumption and are recorded in British collections from as early as the mid-18th century. They were brought back to Britain in large quantities by merchants and officials employed in the various East India companies. The production of solid ebony furniture of this type seems to have first begun along India's Coromandel Coast, a textile-producing region where a number of East India company trading factories were based. A Dutch traveller recorded that the Coromandel Coast 'is exceptionally richly provided of this [ebony] as the natives make from it all kinds of curious works, as chairs, benches and small tables, carving them out with foliage, and sculpture'. Other areas in which similar carved ebony furniture was made include Sri Lanka (Ceylon) and the Dutch East Indies. This kind of furniture can be dated to the second half of the 17th century. However, the presence of such pieces in certain houses with Tudor associations and the use of twist-turning (spiral-turning), which was believed to be typical of Elizabethan furniture, seem to have led the influential collector and connoisseur Horace Walpole (1717-1797) to deduce that they were examples of early English work, a belief that continued to be held for most of the19th century. 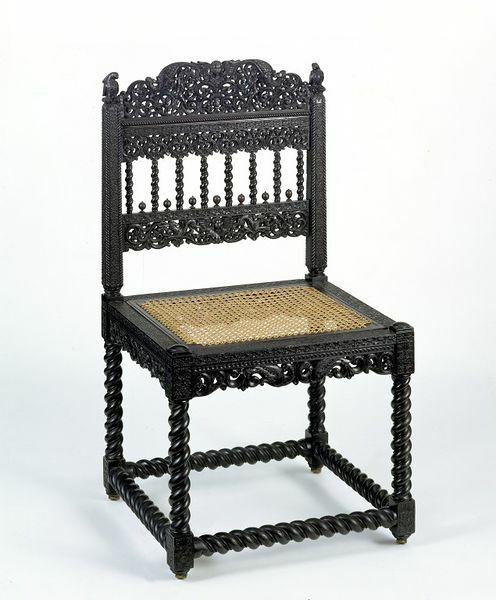 Chair of carved and pierced ebony with a caned seat. furniture is not quite what you supposed. and Cary [Welch] and their wives. This was in the late 1950s or early 1960s. for pieces and a further impetus was given by the V&A's 1970 exhibition. about the Eaton Hall furniture in an old issue of the Connoisseur. bought 2 of them, so the V&A table may be one of the other two. to finish but may be able to do so later in the month. "No other group of Indo-European furniture has been as misunderstood as carved ebony furniture made in India, Ceylon and the Dutch East Indies in the second half of the seventeenth century. The furniture itself is of solid ebony, pierced or carved in various degrees of relief, with twist-turned components. Among the forms made were large suites of chairs and settees; and, less commonly, tables, cradles, beds, cabinets and boxes. The production of solid ebony furniture of this type seems to have first began along the Coromandel coast, a textile-producing region settled with European trading factories. Dutch traveller Georg Rumphius (1627-1702) recorded that the coast 'is exceptionally richly provided of this [ebony] as the natives make from it all kinds of curious work, as chairs, benches and small tables, carving them out with foliage, and sculpture'. Carved ebony chairs of this type have been recorded in English collections from as early as the mid-eighteenth century, and much of the confusion about their origin is due to the belief, current in the second half of the eighteenth and most of the nineteenth century, that they were surviving examples of early English furniture. This idea was supported by the rigid, rectilinear forms of the furniture, which looked antiquated to eighteenth-century eyes; the use of twist-turning, which was believed to be typical of Elizabethan furniture; the bizarre, intricate carving, which often included mythic beasts and figures that seemed to have been conceived before the vocabulary of classical ornament began to influence English design; and the colour, black, which was commonly associated with furniture of great antiquity. For Horace Walpole (1717-97), who appears to have been responsible for this attribution, notions about the age of such furniture based on its physical attributes were confirmed by the existence of examples in houses with Tudor associations. In 1748 he saw carved ebony chairs at Esher Place, Surrey, and believed them to be the property of Cardinal Wolsey, who had lived there after 1519. Buying chiefly at auction, Walpole acquired pieces of carved ebony furniture for his Gothic Revival house, Strawberry Hill. By 1759 he had furnished what was to become the Holbein Chamber with 'chairs & dressing table' of 'real carved ebony'. The decoration of Strawberry Hill was widely publicized, both by the numerous visitors to the house and through well-circulated published descriptions (1774; 1784). By the early nineteenth century Walpole s view that carved ebony furniture of this type was both English and of early date had become firmly established. In his drawings of 'Ancient Furniture' (1834) A.W.N. Pugin featured a carved ebony chair of the type at Strawberry Hill depicted beneath a portrait of Henry VIII, and in Specimens of Ancient Furniture (published in monthly parts from 1832 to 1836 and then in a single volume in 1836) Henry Shaw included a carved ebony chair of the same type formerly in Walpole's collection. Works such as these, which were used by antiquaries as reference texts, established the significance of carved ebony in houses with Gothic and Tudor style interiors, whether old or newly created." Amin Jaffer, Luxury Goods From India: the art of the Indian Cabinet-Maker, London : V&A, 2002, pp.46-47, ill. ISBN: 1 85177 381 9. Carved ebony chair, made on the Coromandel Coast, South-East India, 1660-80. Amin Jaffer, Luxury Goods From India: the art of the Indian Cabinet-Maker, London : V&A, 2002, pp.130-7, ill. ISBN: 1 85177 381 9. p.46/47.